Gently but effectively opens up nasal passages from within to maximize airflow and hence reduce snore. You can breathe easy with this invisible nasal strips. Can be used to reduce snoring, increase air flow when exercising and relieve nasal congestions due to allergies and flu. 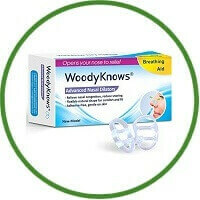 Why Choose WoodyKnows Invisible Nasal Strips? WoodyKnows is a nasal dilator that allows you to breathe efficiently and maximize airflow. The WoodKnows is not only for sleeping but also for daily wear with allergies or other nasal conditions.